A burglary is a very confusing time for the victims. They have to deal with the police, get a mobile locksmith Atlanta to change their locks and take not of everything they have lost. The most recent Uniform Crime Report published by the FBI revealed that in 2012 there were nearly 1.4 million home burglaries in the U.S. and each household suffered an average of $2,188 in property loss. Whether that property is made up of the top six most stolen items or objects with sentimental value, coping with the loss of your belongings after a burglary can be difficult. However, with a little foresight, you may be able to recover some of your possessions. Here are a few tips that can help you increase the odds of finding your stolen possessions after a home burglary. It’s likely that many of the items in your home – especially electronics – are mass produced, which can make identifying your belongings very difficult. Fortunately, you can help prove ownership by keeping a detailed record of your possessions. In your list, make sure to include each item’s unique serial number, model type and manufacturer – all of which can be found on the back or bottom of the product. It’s also a good idea to save receipts to prove the date of purchase and value of your property. Remember to store your records somewhere safe – preferably outside of the home – and periodically send an updated electronic file to yourself via email in case your computer is stolen. It’s imperative that you contact the police immediately after a burglary occurs in your home. Not only will they ensure the safety of you and your family, but they will also generate a police report, which is crucial to beginning the recovery process. Be prepared to give police your contact information and a full account of everything that happened. The police may also want a list of items that were taken, so once it is deemed safe to enter your home, grab a notebook and begin making a list of what’s missing. If you realize that you left an item off the list after it’s been submitted to police, contact your local police department immediately so that they may update your report. Research from the Alarm Industry Research & Educational Foundation (AIREF) shows that a majority of burglars sell stolen goods immediately after committing a crime. For the best chance of recovering your items, you must act quickly. Look for items that have recently been put up for sale in online classifieds and at local pawn shops or consignment stores. If you come across your property, don’t take matters into your own hands. Simply ask the owner to put the item(s) on hold. Then, contact your local authorities, provide them with your police report number and let them recover your belongings. 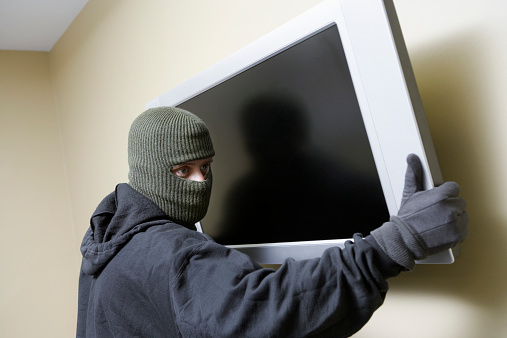 Taking steps to prevent a burglary is the best way to ensure the safety of your possessions. Consider investing in a home security system – it’s one of the most effective tools in deterring property crime. A recent study revealed that 60 percent of incarcerated burglars admitted that they would seek an alternative target if they discovered an alarm system at a home. However, not all security systems are created equal, so it’s important to select a trustworthy home security provider that can install a reliable system that is customized to your needs. Companies that are members of the Electronic Security Association (ESA) are among the most credible security system installers in the country and must adhere to strict Code of Ethics and Standards of Conduct. You can find a local alarm company that is a member of ESA here.